Thank you for taking a few moments to browse our site during your busy search for Montana Real Estate! Realty Northwest is located in the scenic town of Thompson Falls, Montana, the Sanders County seat, about 100 miles NW of Missoula, Montana. We hope to aquaint you with our quiet little neck of the woods, so please feel free to browse through the Montana communities listed below, and please give us a call if you have any questions! "town size", "town ammenities' type of information. magical places that are usually known just to the 'locals'! Just click below to begin your journey! 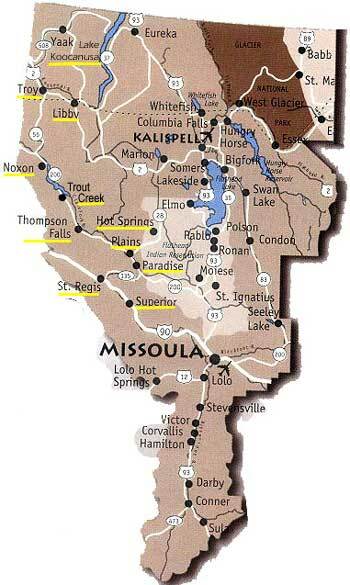 This site is dedicated to the promotion of Montana real estate for sale. for those seeking a cleaner, quieter way of life. Give us a call today, and one of our professionals will be happy to assist you in finding your Northwest Montana dream property!